One of the dumbest things about our pantry is the large open area at the bottom. Jack liked to climb inside and shut the door, but in general it was just wasted space that invited chaos. See below. I mentioned yesterday that I bought a sheet of 3/4″ plywood with three projects in mind, and one of those projects was a new shelf for this lower area. I had Nick cut a piece to 22″ by 28″ inches for me and then I primed and painted it and a couple of pieces of scrap wood white. 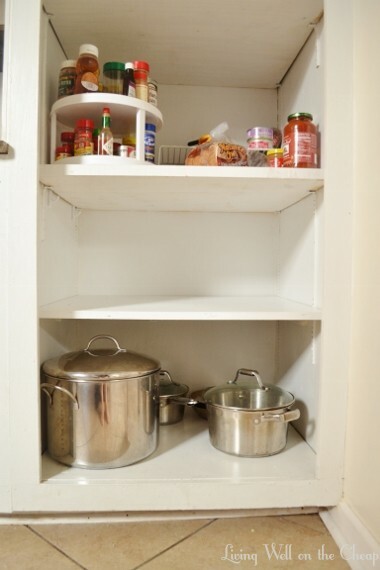 Then we just attached the scrap pieces to the pantry walls with some screws and set the shelf on top. I’m realizing looking at this photo that I probably should screw it down in at least one place because Jack is really into climbing lately and it could possibly tip forward. If you look closely you can see him trying to climb onto my back in the reflection of the large pot. I left the shelf empty for now because once I get the new doors put on I want to try putting the microwave there. I figure we’ll try it with an extension cord first to see how we like it and if it works then we can consider having an electrician install an outlet. If that doesn’t work out then it’s the perfect height to put baskets with sippy cups and toddler-approved plates and bowls and snacks. I also touched up the rest of the shelves and the frame of the pantry while I had the paint out. It looks so much better and already feels much more spacious without those bifold doors cramping the opening. I can definitely add this shelf to the list of projects that I can’t believe I waited so long to do. It was so easy and practically free since I needed the plywood for another project anyway. What do y’all think about the idea of putting the microwave in the pantry? I really want to get it off the counter but Nick is hesitant. I feel you about the microwave. We finally moved ours above the stove last year. I think it would be nice in your pantry, but you would have to run electrical if it’s not there. The middle shelf that is the same height as your counters would be perfect. Maybe set it in there and see how you like it. Does your microwave have a lockout feature? I wouldn’t want it that low with a toddler on the house.